Click here to read Part I about the Central Coast and Southern California and here to read Part II about the Great Central Valley. This week we feature the North Coast and Mountains. To the Ferry Plaza Farmers Market from Marin, Sonoma, Mendocino, Siskiyou and Butte counties come cheeses, meats, vegetables, apples, late stone fruits, and blueberries. The Coast Range, Klamath Mountains, Cascade Range, and Sierra Nevada Range form a horseshoe around the upper part of the Central Valley and influence the climate, water availability, and thus agriculture of Northern California. Just north of San Francisco across the bay, Marin County’s fog and hills make for wonderfully green pastures upon which many types of livestock are raised. The dairy industry began in Marin in the mid-nineteenth century, and the county once produced 25 percent of California’s butter. Today, milk is still the number one agricultural product in Marin. Though its topography and soil make Marin less than ideal for intensive farming, some lower-lying areas of the county with rich alluvial soils are known for producing delicious vegetables. 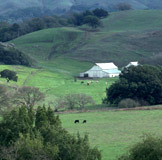 Marin County also serves as a model for agricultural land preservation and ecological farming. All of the farmers that come to the Ferry Plaza Farmers Market from Marin are certified organic, and Marin Organic, a nonprofit organization based in Point Reyes Station, is working to make Marin the first all-organic county in the nation. Without the efforts of the Marin Agricultural Land Trust and important zoning decisions, Marin could well have become a much more suburban county. Indeed, because of its proximity to large urban centers, it has been threatened many times. Sonoma County, north of Marin, was once a robust apple-growing and processing region. Coastal fog, consistently cool evenings, and acidic soils are all ideal for apple-cultivation. However, because of lower yields here than in some of the country’s newer apple growing regions, today only a small percentage of the land once devoted to this quintessential American fruit supports apples. In recent years, Sonoma apple orchards have fast been supplanted with more lucrative vineyards. If the remaining small apple farmers like Stan Devoto of Devoto Gardens are to coexist with large domestic and international growers, they must have direct marketing outlets like the Ferry Plaza Farmers Market because processors like Martinelli’s pay only six to eight cents per pound. Many of the goat and cow milk cheeses sold at the Market come from Sonoma County, also a wonderful environment for raising livestock. Redwood Hill, Achadinha, and Spring Hill dairies produce outstanding cheeses and other dairy products. Several diverse vegetable growers come from Sonoma as well, including Tierra Vegetables, and White Crane Springs Ranch. North of Sonoma in Mendocino, wine grapes account for much of the agricultural acreage, and have been cultivated in the county since the 1850s. The two farms that come to our market from this county are Bodega Goat Cheese/Yerba Santa, and the famous Apple Farm, know for their on-farm education and diverse apple orchards. The Ferry Plaza Farmers Market’s central location between northern and southern farming regions is a distinct geographical advantage. Though most of our farmers come from within 100 miles of San Francisco, some farms make the trek from the very far reaches of the state. Among them, Hunter Orchards, from Siskiyou county, brings lavender, late cherries and Rocambole garlic. Also from Siskiyou county comes Prather Ranch beef. From the eastern side of California at the base of the Sierra Nevadas comes Sierra Cascade Farm with blueberries and Woodleaf Farm with peaches and pome fruit. In eastern Butte county, summers are warm but autumns and winters quite cool and both farms claim these conditions add a lot of sweetness and flavor to their fruit.